The so called Traveler Journey, in the Tourism industry, can be broken down into 5 micro-moments. 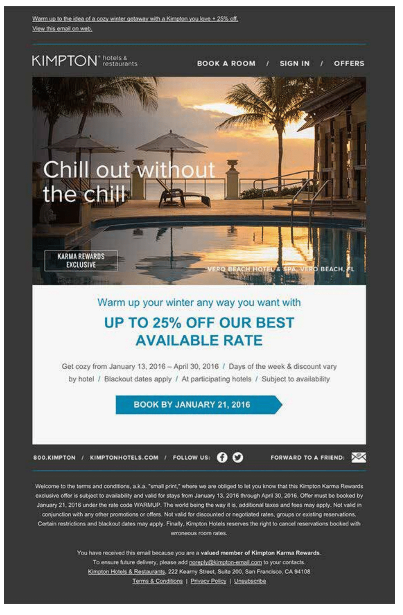 Shape the perfect Email campaign for each and every one of them, and convert a one-off traveler into a loyal guest. In an era of digital natives, the Tourism & Travel industry ought to focus not only on finding new guests and customers, but on building a long-lasting relationship with them. A one-off guest is fine, a returning one is much, much better. 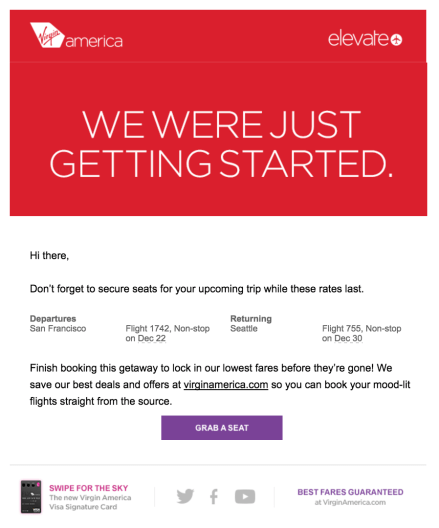 In this post we’ll break down the Traveler Journey and the purchase process into 5 micro-moments, suggesting effective email strategies to be put at work right away. Dreaming moments happen when people explore travel options and fantasize about destinations – without having any definite plans. At this stage, people are looking for inspiration. Here is what you can do to be really effective. In everyone’s experience, traveling is linked to experiences that involve food and wine tasting, art, wellness/fitness, extreme sports, shopping, and so on. Through Content Marketing you can create valuable content that covers the most diverse fields, with the aim of capturing the user’s interest. 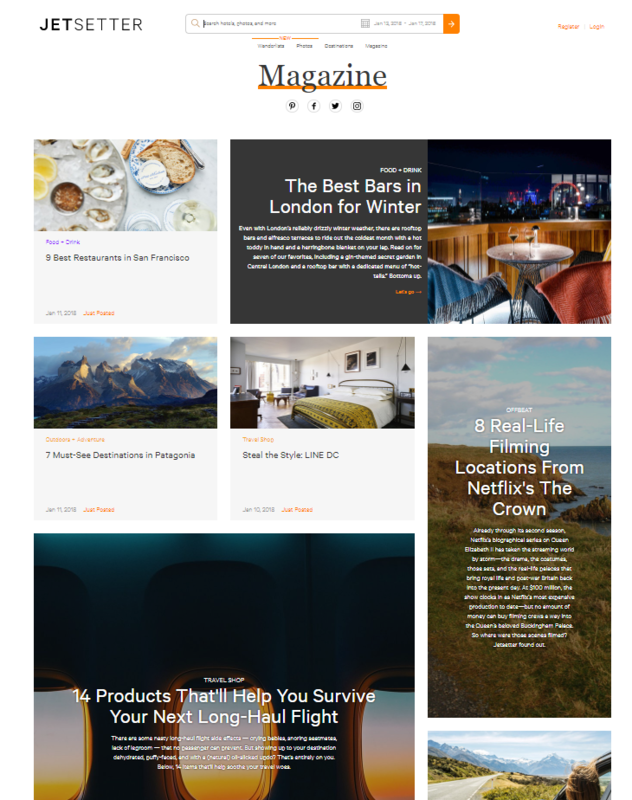 Jetsetter, for instance, with its Magazine offers curated, quality content including news about cultural destinations, attractions, cuisine, design and travel accessories. VRBO instead focuses on the adventurous type of travelers – those who enjoy reading all about a location’s history, culture and everything inbetween. The following email is targeted specifically to TV series junkies – the header reads “Wake up in Westeros”, the imaginary continent where popular TV series Game of Thrones takes place. 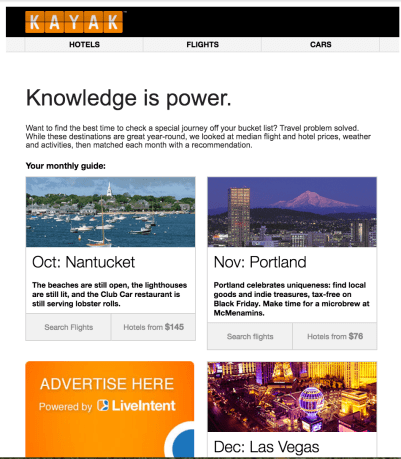 The approach of a company such as HotelTonight is quite different. In the following email the focus is no longer the location, but the price. It is an email for all those whose budget dictates the destination, and not the other way around. Travelers love surprises, and a special email wishing them a happy birthday or celebrating another type of anniversary will not go unnoticed. 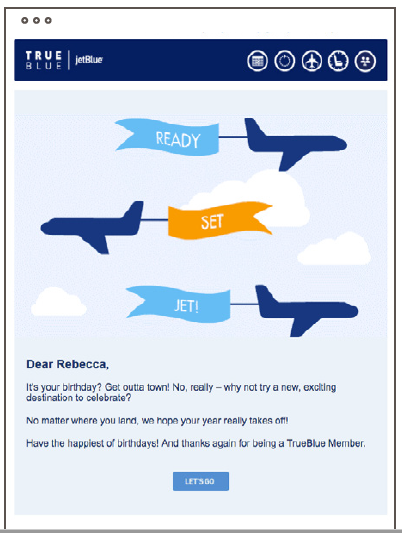 A happy birthday email is a great push for a new booking. Better still, if a discount or coupon adds to the warmest wishes. Ok, so your user has penciled down ideas, considered options, and narrowed its choice down to a few destinations. Now it’s a matter of planning ahead and finding the right flight on the right date for the right destination. A must for any tourist site or hotel. Special discounts and offers provide the best incentives for urging recipients to convert and book. The email gets straight to the point, clearly showing the discount and terms of validity. An email with the effectiveness of a flyer. The terms for the discount validity must be clearly indicated. A countdown has great potential in this regard; here is a great example from Vueling. The countdown is central and in tune with the subject: the style mimics airport arrivals/departures boards. 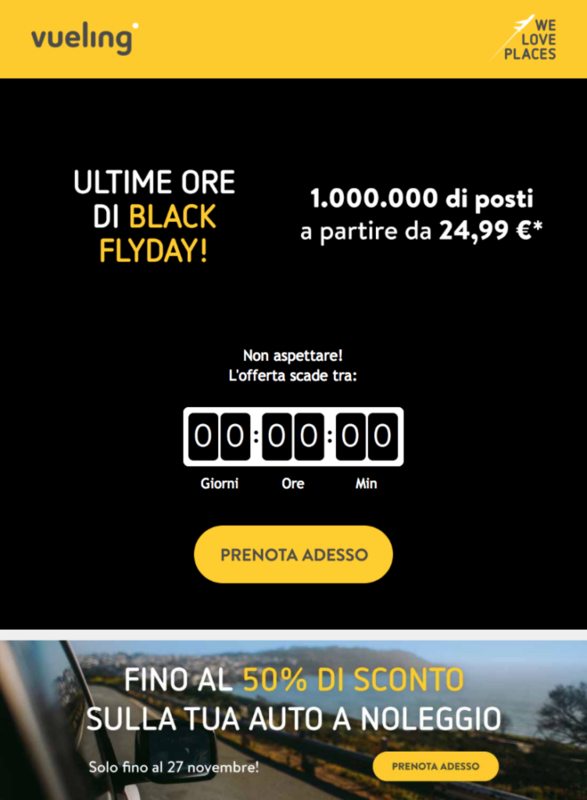 The Black Flyday copy deserves a special mention. 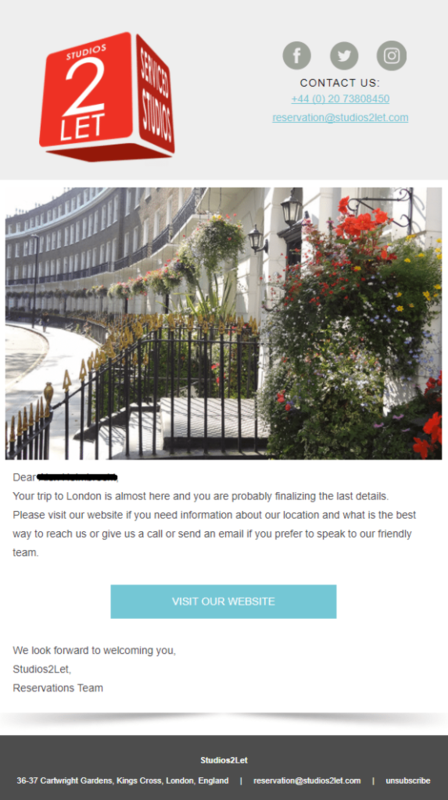 As the equivalent email for recovering an abandoned shopping cart in e-commerce, this kind of email lets you reach those customers who started the booking process without finishing it. The call-to-action is original and immediate; the color stands out and is simultaneously harmonious with the dominant red. This is the moment when the search is over, users are ready to confirm their chosen solution and book tickets and places to stay: conversion. In the case of a resort, additional services can be offered such as excursions, itineraries, access to premium facilities (swimming pool, gym or, for the most exclusive, the golf course), or even the possibility to rent a car. These are all those activities targeting the customer which freely offer him services and information related to his purchase. Virgin is at the forefront in this case as well. Two design details: the ticket’s animated GIF and the weather forecasts. The email simply invites the user to begin to interact with the SMS channel, which is a true star for its immediacy and opening rates (over 96% on average). These are the days just before and after departure. Opportunities for cultivating relationships with users are hidden in these few days and often underutilized. Here are a couple of ideas. With a simple email you can offer a welcome, a small reminder of the trip and renew the expectations about the departure. The intent is to welcome the customer and give him or her the sense that you are by their side if anything happens. This is a fundamental phase of any customer experience, as it combines good manners with tangible benefits, because the feedback always contains useful elements for improving your offer and communication. Even if the customer’s first trip/stay is over, your relationship with them is not. In precisely this moment, a wide range of contact opportunities presents itself. 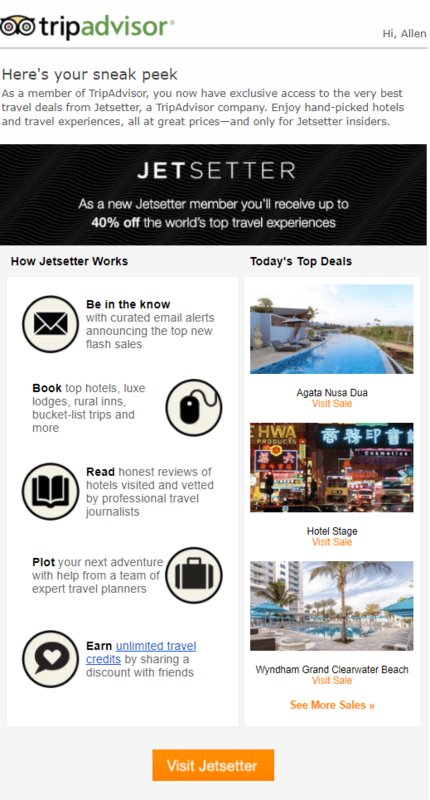 If you have recently enriched your offer with a new destination or a new service, you can use email to present the news and its benefits. 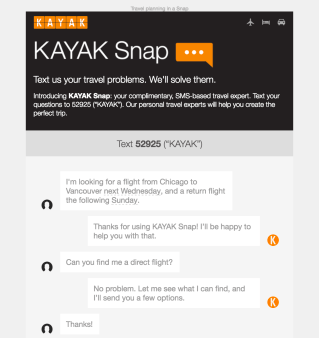 It is clearly advantageous if a customer you already have relations with receives this email. Frequent travelers and best customers are well aware of the value of a good loyalty program. 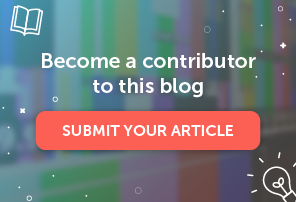 The advice is to fine-tune it by sending an email in the weeks after a customer’s stay to notify them of the points they accumulated and how to convert them. One thing is certain: referrals have a greater propensity to buy. If you have a loyalty program, sending an email to customers to let them know how their friends can participate is a great way to increase conversions. 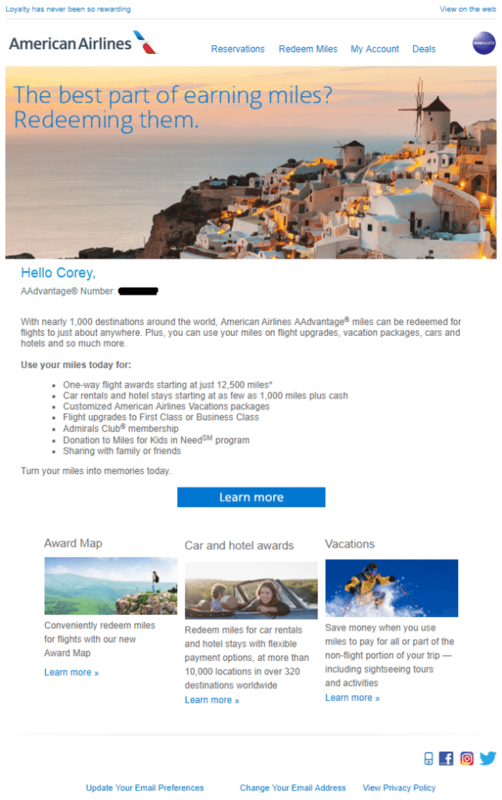 The so-called transactional emails – booking confirmation, notification of changes to the trip, etc. – are, contrary to what you may think, essential emails from the customer experience perspective. 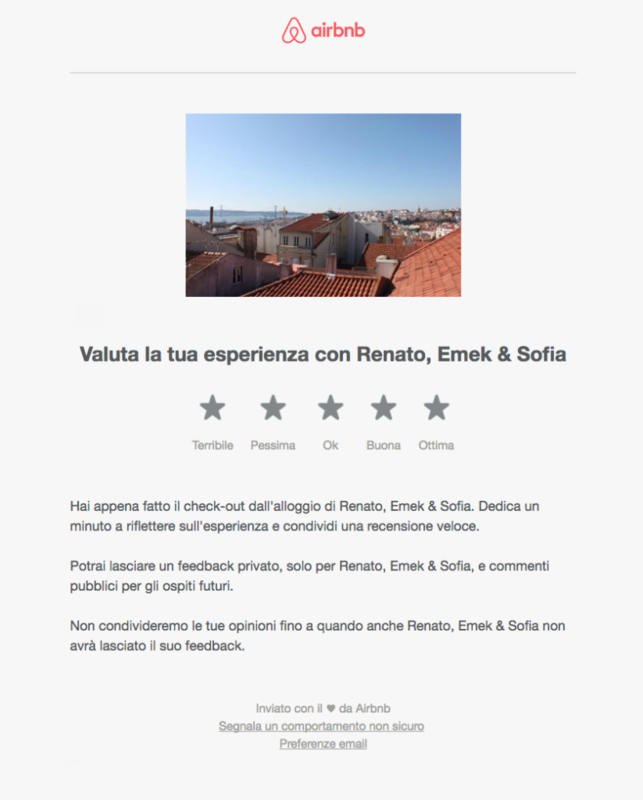 And this is instead one of the classic transactional emails sent by Airbnb. 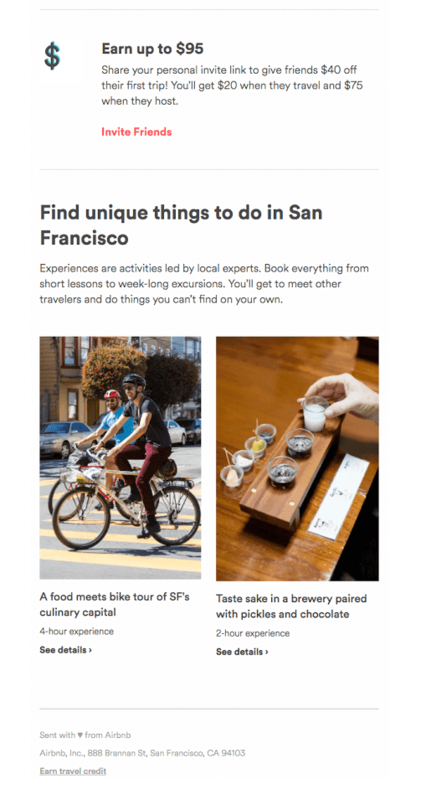 It best reflects Airbnb’s business model, which aims to be nothing more than a bridge that connects people. In short, it minimizes its own presence. 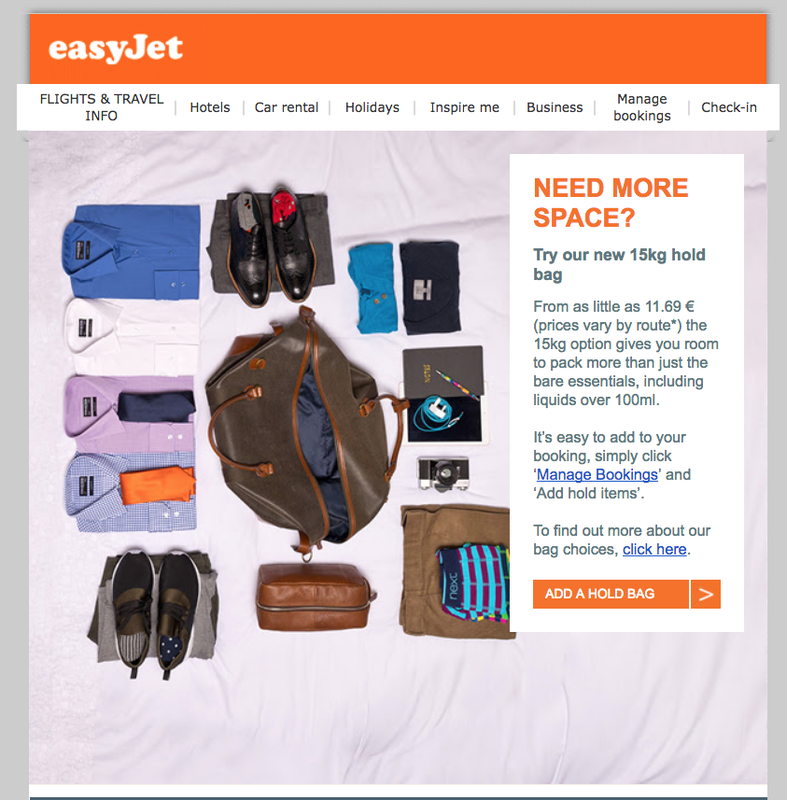 By their nature, transactional emails comprise the category that records the highest click rates. Precisely for this reason, they can be used as trampolines to re-launch a business relationship, proposing new services or offers. 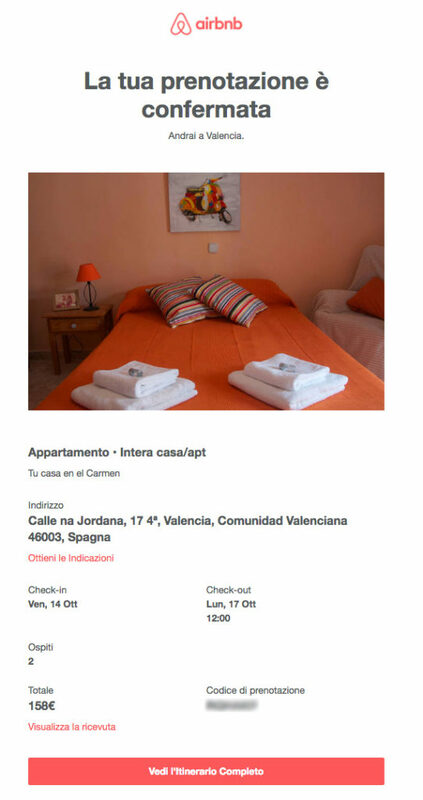 The email below is from Airbnb and notifies a customer of their booking. To save space we have cut out the purely transactional part and left the promotional part. It is an excellent example of the degree of cross-selling strategy (Hospitality → Food) to apply within a transactional email. Database building activities are the prerequisite for any Email Marketing operation, as well as being subject to specific legal provisions. For this reason, instead of buying packages with millions of email addresses, it is better to opt for certain tools and techniques. You’ll find the best ones you’ll find the best one in this post. According to a study by Aberdeen Group, emails have click-through rates which grow by 14% and conversions which grow by 10% when they are personalized. Personalization essentially passes through two key activities: profiling and segmentation. Marketing Automation makes it possible to trigger the automatic delivery of punctual, immediate, and personalized emails and SMS messages. Unlike a one-shot promotional campaign, a triggered message is created and set up only once, and then sent to database contacts whenever certain conditions are met. Here is a collection of posts dedicated to the topic. Knowing how to measure and constantly monitor performance is the only way to understand its value and improve subsequent operations. What are the main KPIs (key performance indicators) of Email Marketing? You can find them here. 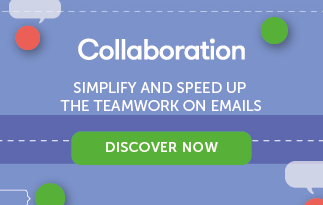 These are all features you can use with the MailUp platform. If you haven’t tried it yet, you can request a free 30-day trial.